Note: All articles are more of personal writings and is written with the only intent of sharing with fellow travelers on the path and in totality reflects the author's personal views only. Just before leaving for another trip, i was just browsing through Facebook and was observing that for the past couple of days the topic on my page has mostly been on detachment, friends being worried about family members, posts being posted on Baba Nityanand's last words before samadhi "Maintain Vairagya (detachment) and Shudh Bhavana (pure intentions)" and also added were the new posts of Babaji's Malaysia shivir on "Art of Ascension" where so many revelations about birth and rebirth was beautifully explained by Babaji. At the same time, there were some posts on my profile page about how animals are reborn among human families and how beautiful our relationships with them are. It spoke of a child whose dog had died and she wrote an innocent letter to God asking God to play with it and take care of it because she misses the dog very badly and truly loves it. Along with a photograph of her hugging her dog, she writes a letter and even posts it with the help of her mother stating that it would need a lot of postal stamps since it has to go all the way to God :) After some days, some kind gentleman posts back a letter to the little girl stating that the letter is from God and not to worry since her dog has reached Him. 'God' also states that it was good that she sent the picture and that helped Him identify it, but since He does not have pockets in heaven, he cannot keep the photo and thus is returning back. have put the picture of a bird that flew into my sister's house and sat for two days fully weak starting at Babaji's photo and the Sri Yantra photo. When she called, i asked her not to disturb it at all as i could somehow guess why it was sitting there. 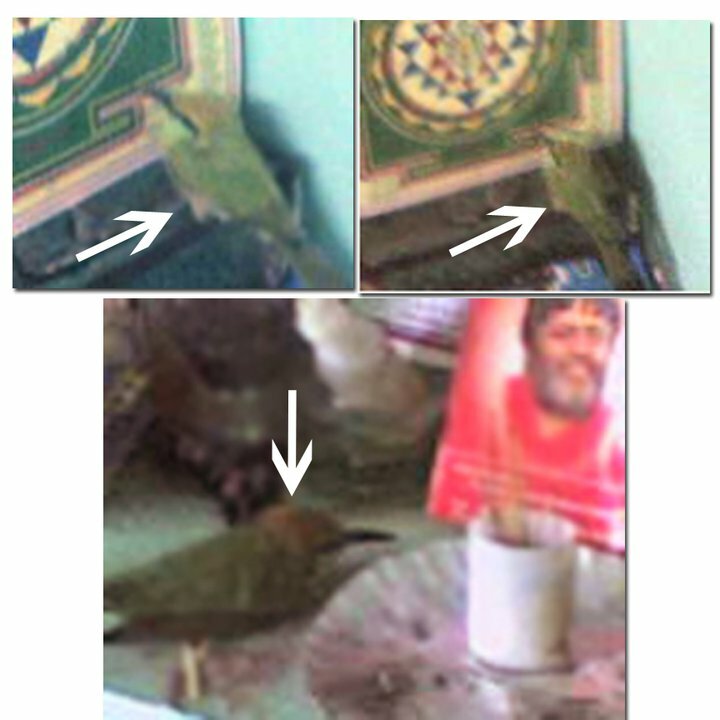 The second day, it died right there in front of Babaji's photo. Also, in one of my latest article on meeting two living Avadhoots, a person living with one of the Avdhoot had mentioned how she once spoke to a bird that sat 'crying' next to her. She told the bird that the bird had done all things in its lifetime before and now in this lifetime if she comes and tells her, what can she do? Read the article here. 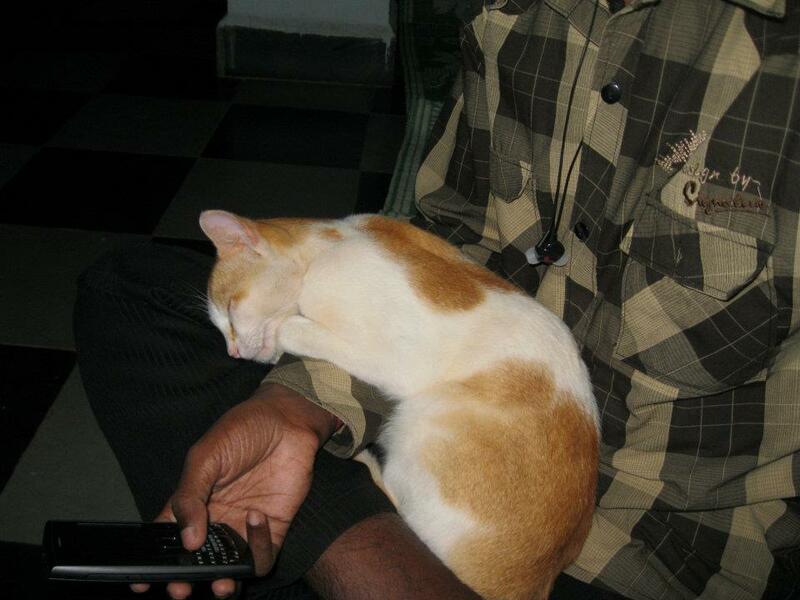 Also, many times were discussions on the divine cat at Anand ashram, the one that meditates and is seeing in all divine activities of the ashram, a very friendly cat that loves to be in the company of meditators. 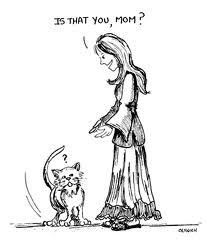 Swami had once mentioned to me that it was a great aspirant in previous life but due to some vasanas it has taken this life of a cat. One night while sleeping in the Nityanand Dhyan Temple, i literally saw it meditating in front of Bade Baba's huge photo for a long time and then before getting up did a long saashtang namaskar to the photo. i had no intentions to write this article since i was busy getting ready to leave out of station, but then i received a very beautiful message from a sadhak friend Vikas that he had extracted from a book. In the part of the script, there contained messages of detachment narrated with a beautiful story. It quickly reminded me of Babaji's teachings and took me straight to the teachings where Babaji explains what happens during death and what factors decide our next birth! It also related to all the recent activities on the blog and common messages and discussions happening between so many people. Thus i thought i must write something and also share that message. So typed whatever flowed. I later found that this wonderful piece of story and message is from a book, "From Death to Birth: Understanding Karma and Reincarnation" By Rajmani Tigunait, who is the direct disciple of the Himalayan Master - Swami Rama. Here is the part of the message that you might want to relate it to your life in the best way you wish to. Those who dedicate themselves to attaining knowledge of the purpose of life putting their mind and heart into sadhana (spiritual practice), are blessed with a higher form of rebirth, known as reincarnation. Those who die before completing their sadhana reincarnate. Following the law of karma, nature rewards their intense sadhana by placing them in the right family. And even if such souls are reborn in a nonhuman species from some reason, they still retain a higher level of intelligence than their fellow creatures, and perhaps they even retain the memory of their previous lifetimes. The following story from the Srimad Bhagavatam will give a sense of the process of reincarnation and the conditions it involves. There once was a saint named Bharata. Content within, this saint lived in solitude in his ashram near a peaceful stream. One day a doe (female deer) who was just about to have a fawn (young deer) came to drink from this stream; suddenly sensing the presence of a tiger, she made a frantic attempt to leap across the stream and fell, injuring herself fatally. In her death throes the fawn was born. Bharata, observing these events, was driven by compassion to adopt the newborn deer. 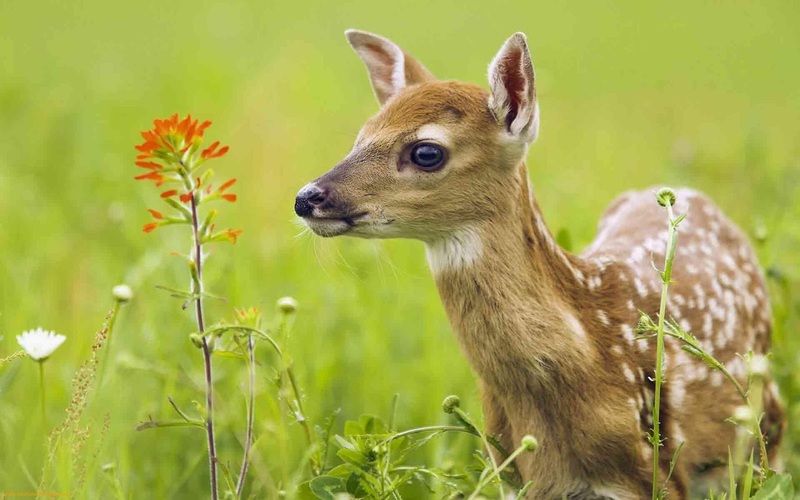 The saint came to love the fawn and raised it as he would his own child. And in his company the fawn lost its natural instincts and became totally dependent on the holy man. But within a few months Bharata fell mortally ill. Although he had mastered the technique of casting off his body at will (thereby avoiding the normal journey after life), he was so worried about what would happen to the fawn that as he died his mind was fully occupied with the deer. His attachment had made him so weak that he failed to remember how to leave his body consciously, so he died as ordinary people do and was reincarnated as a deer. However, because he still remembered his previous life, Bharata was not caught up in the four primitive urges like other deer-he ate just enough to sustain his body, and had no fear of predators. He had no regrets about being born as a deer, but spent, most of his time in contemplation. And with the help of introspection and self-analysis, he came to understand the difference between compassion and sentimentality. When he realized that his time as a deer was almost finished, he decided to drop his body. He remembered the yogic technique he had mastered as a saint, but he could not use it while he was in the form of a deer. So instead, following the path known as muni brata, he undertook the austere practice of fasting until he died. The story illustrates the dynamics of reincarnation. Bharata was established in wisdom and had almost attained freedom from all his karmas. Then, shortly before he died, he incurred a karma that clouded his mind at the moment of death. He saved the fawn out of sheer kindness, but by identifying him-self with this action, he contaminated it, thus compromising its value. 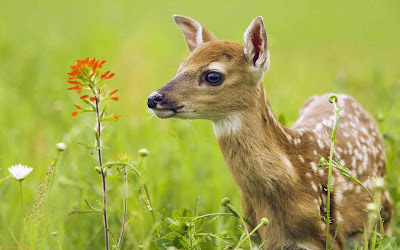 Further, his emotional involvement in helping the fawn led him to worry about the fawn’s future - he forgot that it was God saving the fawn through him and that he was simply an instrument in the hands of the primordial savior, the Divine Being. Bharata also forgot that the same Divine Being would continue to help the fawn after his death. In the presence of an omnipresent God, no creature is helpless. Had he been occupied with other, more worldly thoughts and emotions at the time of death he could have been swept up by the messengers of death and stranded at the river of his mind by confusion and commotion? But as it was, his only thought was concern about the deer, so his entire awareness subsided into deer-consciousness. His samskaras of faith, enthusiasm, retentive power, one-pointedness, and intuitive wisdom were so strong that the pranic forces left his body peacefully, and his mind, accompanied by deer-consciousness, was absorbed in nature. Then, to free him from the deer karma, nature placed him in the body of a deer. Once there, mother nature, in her compassion, restored his memory. Thus, although living in a deer’s body Bharata was still gifted with the saintly samskaras of his previous life. There is much more interesting things in this book but i cannot put it all here due to copyright issues. i was so enthralled with finding similar teachings of Babaji that i went ahead and ordered this book online. If you wish you can on the book link given below. Oh, this was a quick work. i got to leave now to Bade Baba's place ~ Ganeshpuri :) :) Love and prayers to you and everyone. Namah Shivaya.